Sunderbai Gaekwad took the toughest decision in her life a decade ago--to return to her village from Mumbai. Even the precarious existence in Mumbai's slums looked good in comparison to life in Hiware Bazar, her village in Maharashtra's semi-arid Ahmednagar district, hit by constant drought and crop failure. "The village didn't offer any hope," she says. Gaekwad doesn't regret the decision. "This year, I earned Rs 80,000 from the onions I grew on 8 acres (over 3 hectares, ha). I am no more a daily labourer," she says. Gaekwad returned to the village in 1998 after hearing that the state's Employment Guarantee Scheme (egs) was being implemented in her village. "Work on demand was the incentive," she says. "But what made the difference was the water conservation work that the village took up using the scheme." Gaekwad started sharecropping soon after her return on 2 ha.Water ensured by watershed development gave assured returns; wages from egs work supplemented that. In 2007, she bought 3 ha with a bank loan and started growing onions. The gram sabha (village council) stood guarantee. She doesn't need egs work anymore, like most other villagers. Gaekwad's story is emblematic of Hiware Bazar's reversal of fortunes. In the past decade, people who had left the village in search of work have been returning in a steady stream. Going by the official panchayat records, 40 families returned to the village between 1992 and 2002 from Pune and Mumbai. They had migrated out in the late 1970s and early 1980s. With the return of these families, the number of households increased to 216 in 2007. This reverse migration began in 1995 with the implementation of the egs, but the seeds of the turnaround were sown a few years before that. In the 1970s, Hiware Bazar, famous for her champion Hind Kesari wrestlers, lost its fight against ecological degradation. With just 400 mm of annual rainfall (Maharashtra's Marathwada region in which the district lies gets 882 mm), the village needed to protect the forests in the surrounding hills--its catchment areas--but didn't. "The naked hills shocked the elders in the village. They were home to mogra flowers and fruit trees once," remembers Arjun Pawar, the sarpanch of the village from 1975 to1980. As the hills got denuded, the runoff from the hills ruined the fields. Agriculture became unrewarding. Drought was chronic and acute--a slight drop in rainfall resulting in crop failure. The village faced an acute water crisis, its traditional water storage systems were in ruins. In 1989-90, hardly 12 per cent of the cultivable land could be farmed. The village's wells used to have water only during the monsoon. Families began to shift out, first seasonally, then permanently. Those left behind further cleared the dwindling forests for survival. "Even government officials shifted out and soon Hiware Bazar became a punishment posting," recalls Maruti Thange, a 56-year-old farmer. Shakuntala Sambole, a 50-year-old villager now an anganwadi helper, recalls the days when water was not available. "I abandoned farming my 7 acres (2.8 ha) and became an agricultural labourer, earning Rs 40 a day," she says. Now she has bought 4 acres (1.6 ha) more and grows tomatoes and onions. She earns around Rs 100 a day just from selling vegetables. Today, a fourth of the village's 216 families are millionaires. Hiware Bazar's sarpanch, Popat Rao Pawar, says just over 50 families have an annual income over Rs 10 lakh. The per capita income of the village is twice the average of the top 10 per cent in rural areas nationwide (Rs 890 per month). In the past 15 years, average income has risen 20 times. Hiware Bazar has scripted this miracle by using egs funds to regenerate the village's land and water resources, by creating productive assets like water conservation structures and forests. "Living in the rain shadow area with less than 400 mm of rainfall per annum has its blessings only when you know how to manage water," says Pawar. Though the turnaround for the village began in earnest with the implementation of egs, people had started working towards a revival earlier. The panchayat elections of 1989 were an important milestone. Pawar, who won unopposed, immediately started work for water conservation. The district was brought under the Joint Forest Management programme in 1992. In 1993, the district social forestry department helped Pawar regenerate the completely degraded 70 ha of village forest and the catchments of the village wells. With labour donations, the panchayat built 40,000 contour trenches around the hills to conserve rainwater and recharge groundwater. Villagers took up plantation and forest regeneration activities. Immediately after the monsoon, many wells in the village collected enough water to increase the irrigation area from 20 ha to 70 ha in 1993. "The village was just getting a bit of life back," remembers Pawar. In 1994, the gram sabha approached 12 agencies to implement watershed works under egs. The village prepared its own five-year plan for 1995-2000 for ecological regeneration. The plan was the basis on which egs was implemented. It ensured that all departments implementing projects in the village had an integrated plan. ''We started out in 1995 with egs work under forest department officials, building contour trenches across the village hillocks and planting trees to arrest runoff," says Tekral Pandurang, a farmer who worked under egs. In 1994, the Maharashtra government brought Hiware Bazar under the Adarsh Gaon Yojana (agy). agy was based on five principles a ban on liquor, cutting trees and free grazing; and family planning and contributing village labour for development work. The first work it took up was planting trees on forestland; people were persuaded to stop grazing there. To implement this, the village made another five-year plan. An integrated model of development with water conservation as its core was adopted. An ngo, the Yashwant Agriculture, Village, and Watershed Development Trust, was created as the implementing agency for development works under agy. 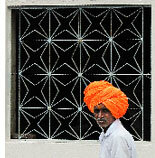 "Villages and the government should be partners in development; but villages must be in the driver's seat," says Pawar. The village invested all its funds on water conservation, recharging groundwater and creating surface storage systems to collect rainwater. The 70-ha regenerated forest helped in treating the catchments for most wells; 414 ha of contour bunding stopped runoff; and around 660 water-harvesting structures caught rainwater. The state government spent Rs 42 lakh under egs in the village to treat 1,000 ha of land, at Rs 4,000 a hectare. It was money well spent. Hiware Bazar is now reaping the benefits of its investments. "The little rainfall it receives is trapped and stored into the soil," says Deepak Thange, who worked on its watershed programme. The number of wells has increased from 97 to 217. Irrigated land has gone up from 120 ha in 1999 to 260 ha in 2006 (see table Intense cropping). Grass production went up from 100 tonnes in 2000 to 6,000 tonnes in 2004. Sakhubai Thange, a 70-year-old villager who has been cutting grass for the last 25 years, recalls the time when overgrazing had made grass scarce. "The efforts put in by the people of the village for soil and water conservation have created a surplus," she says. The grass-cutting season lasts three months, beginning Dussehra. Nearly 80 people go to the forest to collect grass. Rs 100 per sickle has to be deposited with the Village Development Committee, says Sakhubai Thange. Her son, Sambhaji, who accompanies her to collect grass, says, "Residents of Bhuvre Patar village come here to collect grass, aspiring to be like us." With more grass available, milch livestock numbers have gone up from 20 in 1998 to 340 in 2003 according to a government livestock census. Milk production rose from 150 litres per day in the mid-1990s to 4,000 litres now. In 2005-06, income from agriculture was nearly Rs 2.48 crore. Projections are that the 2006-07 figures will be substantially higher, after a good monsoon, with onions alone having been estimated to fetch Rs 1.8 crore. According to a 1995 survey, 168 families out of 180 were below the poverty line. The number fell to 53 in a 1998 survey. There are now only three such households in Hiware Bazar. "There has been a 73 per cent reduction in poverty, due to profits from dairying and cash crops," says Pawar. The village has developed its own set of bpl indicators access to two meals a day; capacity to enroll at least two children in school; and expenditure on health. According to Pawar, those who can't spend Rs 10,000 a year as under these heads are considered below the poverty line in Hiware Bazar. This is around three times higher than the official poverty line. Nobody asks for work under the National Rural Employment Guarantee Act (nrega), which has replaced egs on a nationwide stepped up scale. 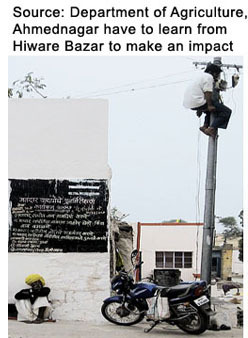 Hiware Bazar's strong, participatory institutional set-up has facilitated success. The gram sabha has the power to decide on a range of issues, including identifying sites for water harvesting structures, sharing water and types of crops to be cultivated. The village voluntary body is its implementing arm. The village's biggest innovation is its water budget (see box Water audit). The village's second five-year plan (2000-2005) focuses on sustainable uses of the regenerated wealth. Habib, a volunteer with the Yashwant trust and Hiware Bazar resident, says, "The essence of the experiment in watershed literacy comes from the gram sabha. It is here that decisions are made. The greatest environmental planners are the villagers themselves." A kolner village resumed its lucrative floriculture in 2005--three years after abandoning it due to drought. Raghu Thange, a farmer, has earned Rs 5 lakh this financial year selling chrysanthemums. The 15-metre open well on his 5-ha plot has water up to 6-8 metres. He has now bought five cows and plans to use organic manure for the next phase of floriculture. The village has learnt bitterly from the drought, says Anil Mehetre, former sarpanch of Akolner. The memory of this period--spread over three years from 2001 to 2003 has still not disappeared. The first ever cattle camp had to cater for more than 400 animals in the village; fodder was scarce, prices shot up to Rs 600-700 per tonne; crops had virtually failed even as people drilled deeper and deeper to extract groundwater for irrigation.The village became notorious as the 'tubewell-village' as the flower and vegetable farmers struggled to keep their operations going. "Ten tankers visited the village every month to provide relief for water scarcity," says Mehetre. He recalls that the entire village was in a state of deep crisis. People asked him to resign from the post of sarpanch. When the state soil and water conservation directorate approached the village for work under egs, there were ready takers. The agricultural department suggested work on small water structures. "During that period, almost 2,500 people worked on these structures in the village," says Mehetre. The officials of the directorate explain that during the drought, the village treated almost 400 of its 2,000 ha area for soil and water conservation by building bunds along agricultural fields. In addition, the five micro-watersheds in the village were worked upon--200 ha of continuous contour trenches were dug to hold water and over 100 earthen plugs--loose boulder dams were made on the drains to impede the flow of rainwater and to recharge groundwater. The difference, the village leaders say is noticeable. While floriculture has resumed with added water in the wells, the big change they see is in the attitude of people. "In the past, when we had good rainfall we still needed tankers to provide us water in peak summer. But we have not seen a tanker for the past two years. Now when it rains, the water stops," says Thange. "The water level in the wells, which had plummeted to about 90 metres in 1998, is now stable at 10.5 metres in 2007," confirms Sarode Sarkale, the block agricultural officer of Nagar block. The challenge remains as villagers continue to exploit groundwater. When asked whether the village had any restrictions on the crops it grew, Mehetre voiced his helplessness. He said it was not possible to restrain villagers from exploiting groundwater or growing water-guzzling crops. But he also said there was one difference in this good rain period now people were taking on drip irrigation so that they could better conserve water. Thange confirmed this. "I do not want to repeat the experience of the last drought," he says, adding that he has already put in drip for his vegetable and floriculture field. He believes he will have answers when next the rain fails. This is the question that haunts the district. Every two-three years the rains fail; sometimes for over three years in a row. When this happens the district goes from prosperity to near destitution. Every time it is more difficult to recover farmers are deeper in debt and more distressed. But this year there is a new confidence. 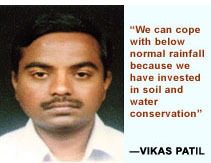 "We can cope with less than normal rainfall because we have invested during the drought in soil and water conservation," explains Vikas Patil, director, department of agriculture of the district. Ahmednagar district lies in the Maharashtra plateau, with flat agricultural land on undulating terrain In most seasons, the hills are bare and dry. Farmers survive mainly on groundwater and levels are declining. Rainfall is variable. In the past 15 years, many years the rains have almost totally failed--even when rains have been bountiful water has been scarce. The average rainfall is around 400-500 mm. But it's persistent failure that breaks the district's back--this happened from 2001 to 2003. Drought and devastation took over. 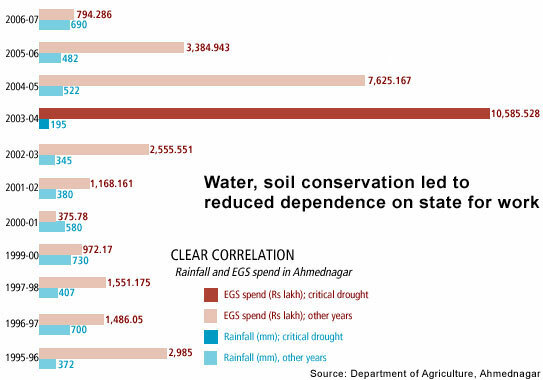 In Ahmednagar, there was a clear correlation between the intensity of drought and egs spending on watershed work and soil conservation (see graph Clear correlation).In 200 3-04, the critical drought year, spending shot up to almost Rs 106 crore, a big chunk of the total of Rs 338 crore spent between 1995-96 and 2006-07. This Rs 106 crore went towards making 201 farm ponds, doing 20,000 ha of continuous contour trenching, another 3,400 ha of compartment bunding and building over 1,000 check dam-like structures in different streams and drains to improve water harvesting. In this period the district built over 70,000 water-harvesting structures. In addition, it treated through trenching and field bunding another 190,000 ha. Of the district's area of just over 1.7 million ha, roughly 11 per cent was worked upon for soil conservation. "We have in these years of scarcity used funds to plan for relief against drought," says Patil (see graphic Ridge to valley). The impact is tangible, say officials, citing three indicators. First, there has been a drastic decline in the demand for employment in the last few average and high rainfall years. In 2006, the district spent as little as Rs 7 crore on building water structures. "No one is ready to work on our public employment programmes. This is because agriculture is booming and labour is short," says Uttam Rao Karpe, the chief executive officer of the district's zilla parishad. This year he says nearly Rs 50 crore lies unspent of the funds for soil and water conservation. A look at the employment demand statistics shows that April-December, 2007, only 7,000 households demanded work, as compared to the 30,000-odd in 2006-07 under nrega. Secondly, the area under crops has increased, farmers have moved to cash crops and yields have risen. "Agriculture has become productive and lucrative," says Karpe. The best indicator is that while during drought there was a desperate shortage of fodder and farmers preferred not to sell sugarcane but use it as fodder, now there is excess sugarcane in the district, say officials. Thirdly, and key, is the improvement in the water table of the district because of soil and water conservation. In the district, roughly 20 per cent of the 1.2 million ha of cultivated land is irrigated. But the bulk of this--75 per cent--is well irrigated. Farmers use dug-wells, which tap the shallow aquifers, and increasingly deeper and deeper tubewells for cultivation. The district groundwater authorities monitor 200 wells to check water levels. Their data shows, on average, there has been a 5-metre rise in water levels between the peak drought period of 2003 and 2007. Analysis of individual wells across different watersheds confirms this trend. 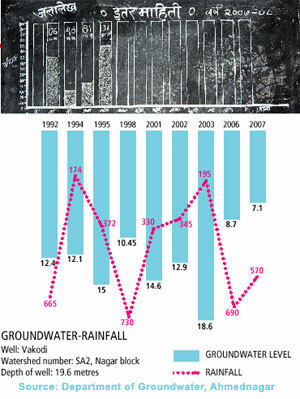 While water levels dropped to 19 metres during the drought of 2003, the near average rainfall the following year has seen an increase and stabilization. Less than average rainfall is not a problem anymore. The key challenges in the future will be to improve productivity, with use of techniques to minimize water use and changing cropping patterns. "The district administration is promoting drip irrigation to counter the increasing use of borewells," says Patil. The next big challenge, say officials, is to protect watersheds--mostly lands under the forest department. "Till now we have mainly worked in the storage zone and recharge zone, not in the upper areas of the watershed," says Ajay Karve, deputy director, district groundwater department. In some cases, labourers could not be motivated to work in the hilly areas due to the lower wages prevailing there, says Mahesh Baosar, the forest range officer who supervized watershed works in upstream areas. "In some villages of the district the areas under watershed projects were treated twice, both by the forest department and agriculture department which has implemented majority of watershed works in the district," says Baosar. "The next phase needs to focus on runoff or hill areas," suggests Karve. This will ensure the district is drought-proofed. The message from Ahmednagar is clear if we can create productive assets then drought relief can become drought-proofing. Currently 330 districts in India are implementing nrega. The question is what will the money for employment be spent on? Between 1995 and 2006, Ahmednagar spent Rs 340 crore, or Rs 28 crore a year on soil and water conservation. This has allowed it to cope with drought. Under nrega, each district, on average, has spent Rs 44 crore, but the bulk of this has not been on water conservation. Despite the officially stated 'non-negotiable' focus on water and soil conservation, funds in most states are being spent on roads and buildings. Till July 2007, 22 other states have negligible allocation for water conservation. Three states--Andhra Pradesh, Madhya Pradesh and Rajasthan--accounted for 96 per cent of water conservation works under nrega. The second lesson is 'how' the drought relief money should be spent to create productive assets. In Hiware Bazar, the village panchayat evolved a five-year plan. It then used the money provided by different government schemes--from egs to the Total Sanitation Programme--to work its plan. It first treated the forest and the catchments for its village wells; it then took up water conservation and soil conservation. It used short-term drought relief funds for long-term development. This will be the biggest challenge for nrega. Conceptually, decentralization is part of the scheme. The village has to make a development plan; the district has to make a perspective plan; the projects have to be cleared by the gram sabha and implemented by the panchayat. The question now is how this scheme can indeed replicate the lessons of Hiware Bazar. The third lesson is the role of coordination between the 'on what' and 'how' factors. In Ahmednagar, it is clear that the potential of water conservation will only be realized when the watersheds under the control of the forest department are part of the programme. But even that is not enough. These watersheds, which are used intensively by people to graze their animals, will only be protected if people are involved in planning and reap the benefits. Similarly, all the water recharged through soil conservation and water-harvesting work will not be enough if people overuse and over-exploit. This will require the management of plenty as much as that of scarcity. It is here that village institutions like those in Hiware Bazar hold the key. While every village may not be able to curtail the use of water or control cropping patterns, it is clear that local leaders will have to find ways of dealing with sustainability. They know that the failure of rains is inevitable. The question is if they can make sure that when the rains fail, drought is not inevitable. I am from Chin State, Myanmar. I have been in the USA for 19 years. Went to school at United Theological Seminary in Dayton, Ohio. I have beeni in USA since 1997 but I always dream and thinking how to help my country's fellows and how to serve our Chin people back in Myanmar. The Chin States has experienced water shortages in the summer in recents years both in villages and towns. I believe it is the effect of the Global Warming. Chin State is a very mountainous region and most of them are farmers and cultivators to support their lives. I believe the water shortage will cause economic problems in our land very soon. So, I was studying about Water harvesting around the globe especially in Israel and in India. I saw the youtube about the Water Miracle Village of Hiware Bazar. It is amazing story. The story was very encouraging. It gave me hope, faith and the power of working together in the community. The villagers of Hiware Bazar are wonderful people. You love your village, your land, your people and you haved saved many family lives. Your work is wonderful. Do this good work continously. You are the lights for the world. You had changed your community in a very positive way and your new idea and work will change the world slowly. That is my hope and belief. I am President of Jeshtha Nagarik Sangh Sant Tukaram Nagar Pimpri, Pune. We have heard a lot about your "Ichcha Shakti " to change entire concept of modern developed village with the involvement and cooperation of local population. We wish to visit your town to see the model town development. and so we wrote to you but could not get any response. Kindly reply when we can visit your town. The wonderful example set about working in teams can cope up with natural calamities, moreover that God gives opportunities through challenges we need to get together to act upon it, which Hivare Bajar did shown a path for the world. NAMASKAR. WE ALL ARE FROM BANK OF BARODA RETIREE OFFICERS ASSOCIATION MEMBERS, HAVING GROUP OF 70 RETIRES,WANT TO VISIT HIVARE BAJAR ON 08.09.2017. WE WANT TO VISIT YOUR FIELD AND TO SEE YOUR PROJECTS. CAN YOU PROVIDE US YOUR HELP FOR VISITING YOUR PROJECTS.